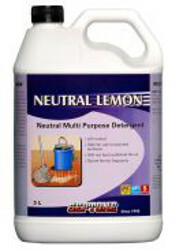 Septone Neutral Lemon is a non-alkaline multi-purpose cleaner and is capable of performing a wide variety of cleaning jobs. It is especially suited to the daily maintenance cleaning of polished floors, because it effectively cleans the floor without affecting the polish. 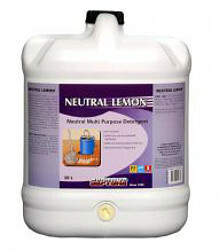 Neutral Lemon is safe to use on most washable surfaces, including floors, walls, benches, vinyl, plastic, paintwork, upholstery, windows, mirrors, stainless steel and woodwork. Neutral Lemon contains a vibrant lemon fragrance.